CCOL offers various ad packages and custom opportunities, so take a minute to send us your contact information with a brief summary of your interests, and we'll contact you shortly! Get your campaign started today! Whether you are Manufactures, Exporter, Trader, Services Provider or Social Net-workers, CCOL can help you connect with them through a variety of offerings and ad placement opportunities, including search advertising. To have a salesperson contact you and explain how CCOL Advertising can help your business meets its unique advertising needs, simply fill out a short form. Have a CCOL Sales Representative contact you. 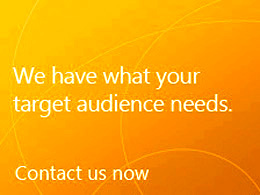 Learn More about how CCOL can help your business meets its unique advertising needs. What is the Media Type of your ad?